The truth is, there is no lack of great gardens in Ireland. But Colclough (pronounced “Coakley”) is a garden with a difference. Once upon a time, this was a 2.5 acre, walled, Victorian garden (first conceived in the early 1800s). Then, it became a huge, walled wasteland. But today, thanks to the incredible efforts of a dedicated team of volunteers, it’s a great garden, once again. The volunteers did the backbreaking work, removing dozens of large trees, masses of weeds and bushes, and then starting to re-create the glory that had once been this garden. They found some sources of funding that now allow the garden to employ a couple of professionals (project manager Alan Ryan and head gardener David Bawden, himself originally a volunteer on the project) – but when you come through the gate, the people with the smiles and the reams of information are still likely to be thoroughly committed volunteers, with dirt under the nails of their very green thumbs. 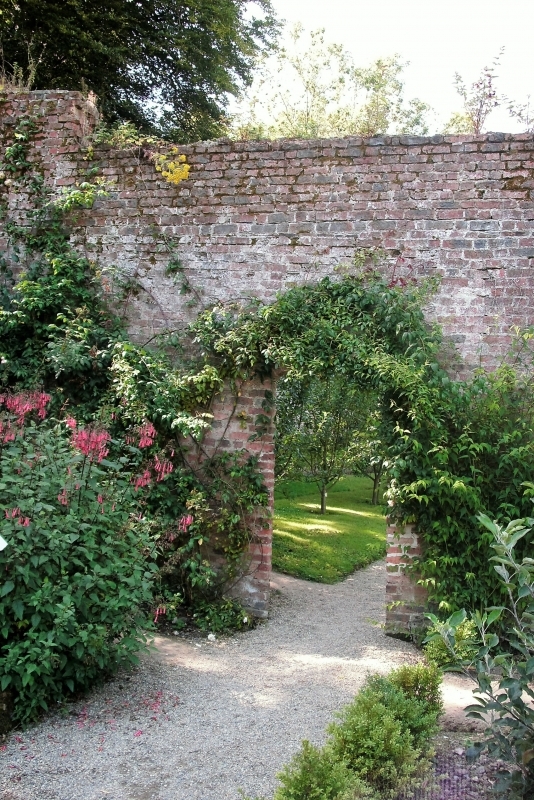 The volunteers restored the garden to its layout as of 1838; although in-ground archaeological evidence was non-existent (unlike the situation at Heligan in Cornwall, England, where abandoned antique plant labels abounded), a map was found from 1838 that told then everything they needed to know. The structure of the garden was still evident – still extant were the walls (although in need of repair throughout), and a stream that runs the length of the garden, now spanned by five different bridges. The garden, then and now, was divided into ornamental and “kitchen garden” halves – although there is beauty in the kitchen, and you’ll find edibles, such as apples, in the ornamental section. The plants in the garden are as authentic as possible to the historic period. The casual nature of the project is evident because, for an unspecified donation, visitors can carry away vegetables and fruit harvested from the garden. Tours can be arranged, but there is no doubt that a very fine way to enjoy this garden is simply to wander – and to linger. 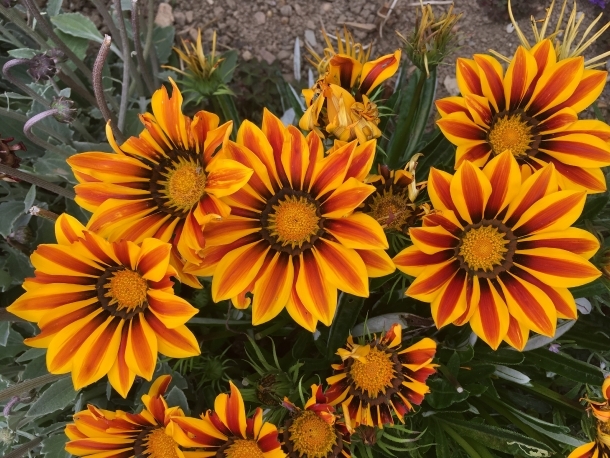 There is beauty here in the panoramic view – the sweep of the garden, the extent of the walls – but very much so, as well, in the details – the unique plants, the spectacular blooms, the healthy vegetables. Colclough is a work in progress – during our visit in August, 2016, an authentic glass house was under construction, and donations were being solicited to help make that a reality. The contributions of volunteers and supporters are still vital to this garden’s success – and rare would be the visitor who would not be eager to offer some assistance. It’s an inspiring place. There’s a huge bonus at Colclough, as well. To get there, you walk past the ruins of Tintern Abbey, half a kilometer from the garden. This site is also unique – it was a Cistercian abbey, founded by its sister house of the same name in Wales. However, it was turned into a Georgian manor house, with the structure of the house built by the family (non-coincidentally, named Colclough) inside the walls of the abbey, but with most of that later structure now removed so visitors can get a real sense of the original grandeur of the place. Tintern is also worthy of a visit – and take the time for a guided tour, which is detailed, intriguing, and quite fun. Then, having spent time at the abbey and in the garden, wander the grounds, explore the walks in the woods, and discover the riverside, the bridge, and the ancient, 13th century church, built on the grounds of an even earlier church. This entire site – gardens, abbey and surrounding walks – will take half a day. Half a day very well spent, indeed. Colclough Gardens are open year round, but are best, of course, in warmer months. Admission is only 3 euros, 2 euros for seniors, students and groups. Plus, admission is free with a Heritage Card from Ireland’s Office of Public Works (www.heritageireland.ie), one of the best travel values around. That card also allows admission to Tintern Abbey. Without the card, admission to Tintern is 3 euros (less for seniors and students). Tintern is open from late March to very early November. Nearby are several good sites; the Dunbrody Famine Ship in New Ross; the Hook Lighthouse (with terrific sea-side views); Dunbrody Abbey; Ballyhack Castle, and more. At Tintern, you are an hour from Waterford, and a bit more from Kilkenny, both popular tourist stops.